Like countless commuters in Denver’s urban core, Marty Otañez can’t help but smell the pot smoke as he rides to work along the Cherry Creek bike path downtown. Increased pot smoke swirling around city streets and parks is one of the most recognizable effects of Amendment 64 — which legalized the recreational use and sale of marijuana in Colorado — particularly since public consumption remains illegal. But there are smaller, less in-your-face ways that show how marijuana has become woven into the fabric of daily life in Colorado. Otañez, a cultural anthropology professor at the University of Colorado at Denver, teaches a class titled Cannabis Cultures. His 13 students examine different aspects of legal weed, from the social effect of decriminalization to using cannabis tea as a stress reliever. The sheer omnipresence of cannabis culture — from the dozens of green-emblazoned pot-shop signs around town to flashy, colorful ads for vape pens and bongs — has worked to erode the novelty and stigma of smoking pot. But so has watching the rise of marijuana-related titles at public libraries — the bastions of approved knowledge for the masses. 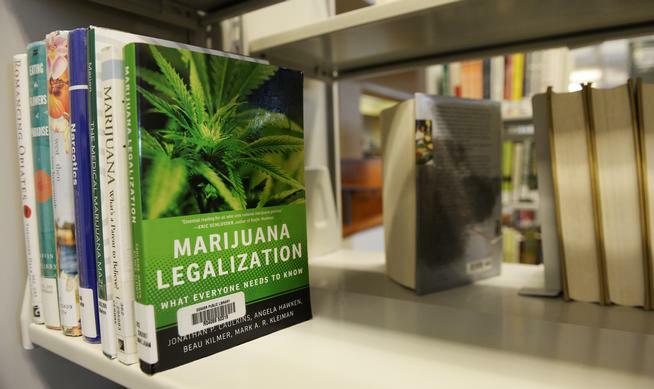 “We’re seeing more interest in quality, vetted books about cooking, growing and social issues surrounding marijuana,” said Chris Henning, marketing manager for Denver Public Library system, citing a 35 percent circulation increase in pot-related titles over 2014. The Denver Public Library bought double the number of marijuana books in 2015 over 2014, he said, which is why “The Cannabis Kitchen Cookbook” recently showed up on the featured shelf at the Woodbury branch in the Highland neighborhood. On the other end of the spectrum, the erosion of stereotypes has created opportunities in high-risk healthcare, said Adrienna Lujan, executive director of the Denver nonprofit Geronimo Enterprises. “Now that cannabis is legal, people don’t have to live in some kind of shame or stigma, which allows us to explore alternatives,” said Lujan, a certified addictions counselor who trains community health workers in HIV and intravenous drug-addict treatments. Those alternatives include using marijuana as a withdrawal buffer for heroin, Oxycontin and crack. The normalization of pot culture is a quest that goes back decades, seen most notably in the name of the country’s oldest, largest pro-pot nonprofit, NORML (National Organization for the Reform of Marijuana Laws), which was founded in 1970. But while “normal” means something different to everyone, Colorado has already made room for a pot-smoking Bible-study group in Centennial ( profiled in a recent New York Magazine article), stoner poker nights, cooking classes, dinner parties and even Colorado Symphony Orchestra events. “As public acceptance changes and federal laws change, this need to hide use is fading,” said Brett Davis, CEO of Denver startup Social MMJ. Davis has organized a Sushi and Joint Rolling class, Munchie Crawl (a pot-pub crawl) and, most recently, a Tacky Light Tour that allows people to smoke on a tour bus while surveying Denver’s kitschiest Christmas displays. The current state of pot consumption — which stipulates it can only be used on private property with the owner’s consent — complicates normalization, but also provides opportunities for businesses such as his. While industry groups and marketing firms work to sell cannabis to skeptics and newcomers, seeing Colorado’s culture in action is a deciding factor for many visitors. My420Tours leads anywhere from 120 to 200 visitors per week to grow operations and other cannabis businesses, allowing them to discretely sample product (on a private bus) and connecting them with hotel rooms. Danny Schaefer, chief operating officer, has watched the business double quarterly and expects My420Tours’ revenues to exceed $2 million this year. “It’s still a novelty to people who aren’t from here,” Schaefer said. However, visiting the Mile High City shows that cannabis is integrated into daily life here, he said. Schaefer even cited a handful of people who, within days of their trip, decided to buy a home in Colorado to bask in the legal marijuana culture. Baltimore resident Bena hasn’t gone quite that far. But she is already planning on spending her 70th birthday in Denver. Updated Dec. 29 at 4:15 p.m. The following corrected information has been added to this article: Because of a reporter’s error, the job title for Brett Davis was misreported. Davis is CEO of Denver startup Social MMJ.